Does he look like a lion to you? Have you heard about Snoop Dogg’s spiritual experience and resulting name change? The story goes that he went to Jamaica, studied reggae and Rastafarianism, and was told by a Rastafarian priest, “You are the light. You are the lion.” Must be a pretty tame lion, because Mr. Snoop appears to want to spread peace, harmony, and love with his new persona. 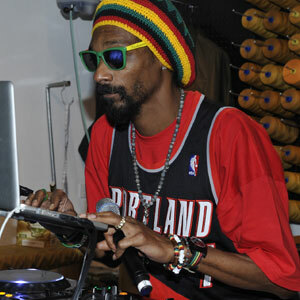 Actually, I’m happy for Snoop Dogg Lion. He’s been rejuvenated, transformed. It’s gotta feel good, to have a newfound purpose in life. Sometimes I get jealous of people who can go off and reinvent themselves. I can’t just jump on flight to Jamaica or Paris or India – I have a family and a regular job, after all. But for those of us who are more tied down, it is possible to experience spiritual transformations. They’re just not always big and explosive and obvious. Sometimes it comes in the form of forgiveness. Sometimes it’s simply standing four feet from Jesus. Sometimes it takes a trip into spiritual coldness to bring me to a place of peace. Part of me wanted to pick a “strong” woman – one of the female saints called Equal-to-the-Apostles, maybe. A saint who wouldn’t shirk at the idea of me being a working mother. But in reality, my primary roles are wife and mom. They are the roles I care about most. I want to be like Nonna, faithful in prayer, balancing home and work and spirituality. So today, my saint day, I remember that spiritual transformation I went through – and am still experiencing. 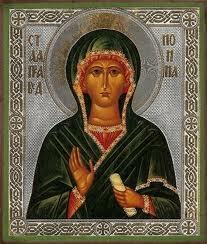 I wonder if I’ve come any closer to representing the woman whose name I bear in these past seven years of Orthodoxy. I hope so, but I know that I need God’s grace and help – and my Nonna’s intercessions – to continue on this path of spiritual reinvention. Very descriptive blog, I enjoyed that bit. There has to be part 2?